Whether you are looking for an engagement ring for that special someone or are trying to find earrings or other jewelry for the perfect gift, there are an overwhelming amount of decisions to make. While most people go to diamonds for their beauty, there is a diamond alternative that not only costs less but comes with numerous benefits. Moissanite is one of the most brilliant gems available on earth and can have benefits that outweigh the diamond. Today, we are going to quickly cover five reasons why purchasing moissanite may be more beneficial than purchasing a diamond. Before we get started on the benefits, we find it fitting to briefly go over what moissanite is. While diamonds can be found naturally occurring on earth, moissanite can only be found naturally occurring in meteorites. And because meteorites are not very common, all moissanite stones used in jewelry today are flawlessly created in laboratories. Because this lab-created stone has so many benefits, it is quickly becoming one of the most popular and desired gemstones in the world! Whether you are purchasing a beautiful moissanite engagement ring or are looking for a pair of moissanite earrings, choosing the lab-created stone will entitle you to plenty of benefits; check out why moissanite is quite a beautiful and wise choice. One of the number one reasons people choose to purchase Moissanite engagement rings instead of diamond rings is because of the cost. In fact, moissanite a fraction of the cost of a diamond. While a one-carat diamond may cost around $5,000, you can easily find moissanite stones priced around $600. Because it is made of silicon carbide, moissanite stones are very durable and sturdy. While the diamond is the only other stone harder than moissanite, they both have similar durability and are resistant to chipping or breaking. Everyone likes a shiny rock, which is why moissanite is preferred by many. Moissanite has a greater light return than a diamond, allowing it to shine and shimmer even in the dullest lighting. The solidity of a moissanite gem will create a band that will last for a very long time. The gem itself will keep its shine and never become dull or gloomy. Moissanite stones last so long that they can be passed down to your family for years to come. When you wear a moissanite gem, you get the peace of mind in knowing that the stone is conflict-free and ethically sourced. Mined diamonds are not sustainable, while moissanite stones are never mined! 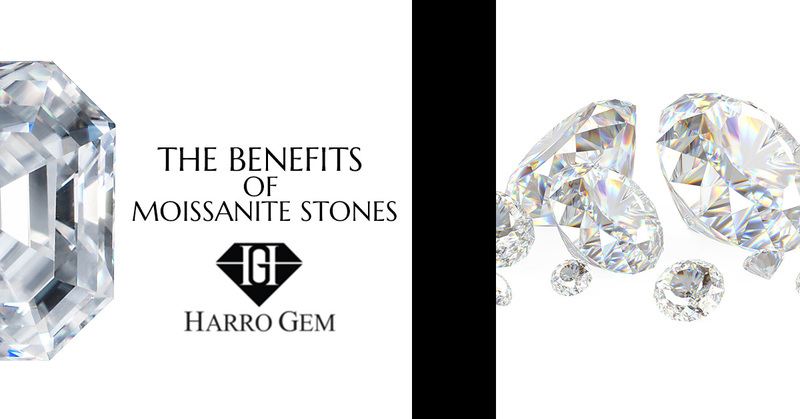 If you want to experience the benefits of purchasing moissanite jewelry and stones, be sure to shop at Harro Gem. Harro Gem carries the highest quality moissanite that is available on the market. To learn more, or to purchase moissanite jewelry, like inexpensive engagement rings, visit our site today! © 2019 Harro Gem – Custom Cut Moissanite.